After an extensive selection process, British artist J.M.W. 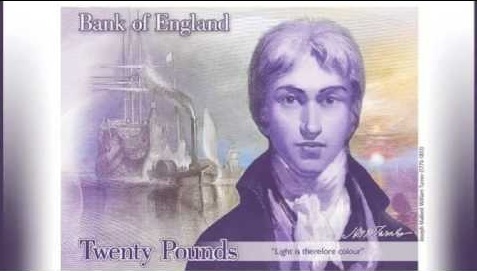 Turner has been chosen to adorn the new £20 note starting in 2020. United Kingdom– The United States is not the only nation in the Anglo-American sphere redesigning their 20 unit paper currency. The Bank of England has announced the upcoming issue of the new £20 note will be adorned with the 1799 self-portrait of famous British romantic painter J.M.W. Turner. The newly designed currency is set to debut in 2020 and will be constructed of a polymer substance. The decision to feature Turner was announced on 22 April after an impressive competition to design the new bill with the image of an artist. The Bank of England composed a selection committee that created a shortlist of five suitable candidates. These candidates consisted of actor Sir Charlie Chaplin, painter William Hogarth, sculptor Dame Barbara Hepworth, and designer/potter Josiah Wedgewood. The final decision fell upon the Bank of England’s governor, Mr. Mark Carney, who also served as the decision committee chair. Mr. Carney’s statement demonstrates how a country’s currency acts as a cultural reflection in its society. From the Caesar’s that adorned Roman coinage in antiquity, to the portrait of the current U.K. Monarch, Queen Elizabeth II, which is updated each decade to reflect her age on the currency used in the Commonwealth of Nations, most every society uses the images on their currency to highlight the most prominent figures in their culture. Additionally, the appearance of any country’s currency communicates internationally a society’s current attitudes. As previously mentioned, the U.K. was not alone in its decision to undertake a major facelift on its paper money. The United States Department of the Treasury’s decision to replace the seventh U.S. President, Andrew Jackson, on the front of the $20 bill with legendary abolitionist, former slave, Underground Railroad and Civil War heroine Harriet Tubman is a landmark decision in the U.S. Tubman is also set to debut on the $20 bill in 2020. Tubman is not the first woman to grace U.S. currency. Susan B. Anthony, famous for her role in the U.S. woman’s suffrage movement appears on a U.S. half-dollar coin. Golden $1 coins also depict a woman: Sacajawea, a member of the Lemhi Shoshone Trive whose work made possible the Lewis and Clark expedition. Harriet Tubman now joins their ranks as the first woman to be featured on U.S. paper currency and the first African-American to receive the honor. With these prominent impending changes to these power-house nations in the Western world, the appearance of currency remains a strong reflection and self-critique of the popular cultures of the nation states that issue them. Sources: BBC World Service, The Guardian, The New York Times, The Bank of England, The U.S. Treasury Department.